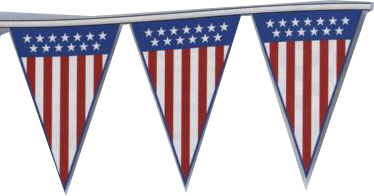 Extra large 12” x 18” Jumbo Patriotic Poly Pennants are sure to attract attention. Each string has alternating Stars and Stripes pennant fields. Great for any holiday or patriotic celebration. Made of 4 mil. Poly. these are great for the short promotion. Made of 4 mil Polyethylene.